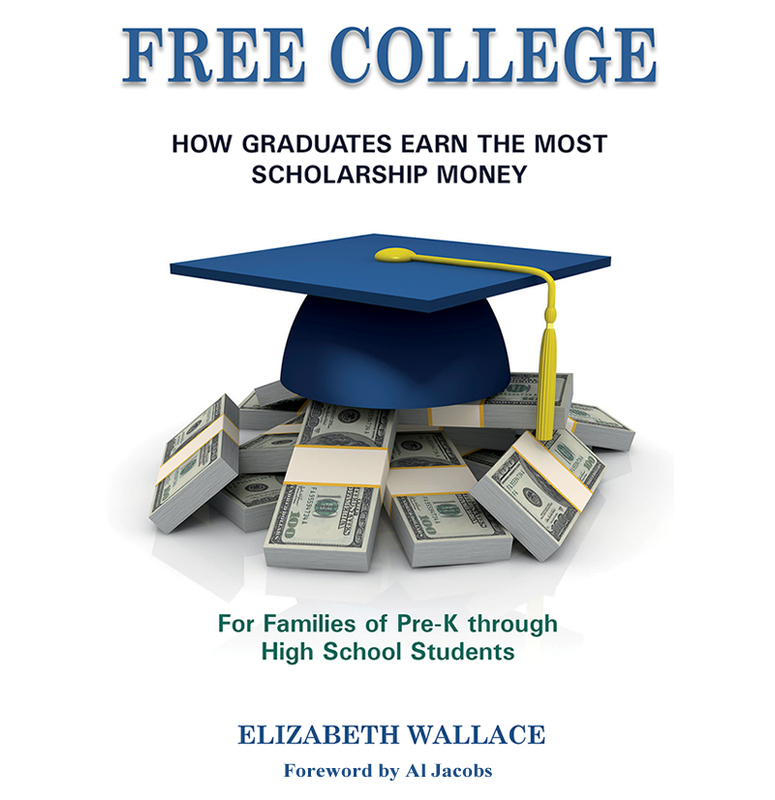 One way for students to improve their chances of winning a Full Ride Scholarship to college is to do everything possible to remain alert in class. A simple way to do this is to eat breakfast every day. I found it easiest to prepare almost everything in advance. It begins with making a shopping list. Once the decision is made to eat breakfast daily, deciding on what to eat comes next. Steel cut oatmeal provides many of the recommended nutrients for optimal brain function. Making it from scratch each day really isn’t practical. It takes too long to cook. There are two possible solutions. One saves time and money, the other saves much more time than money. Both are equally delicious and nutritious. Students and their parents just need to take an honest look at which works best for them. To save the most time, go to the frozen section in your market, and find pre-cooked, frozen steel cut oatmeal. Be sure to read the label, you don’t want to see sugar there unless it’s a very small amount. Sugar short-circuits thinking, not a great idea for breakfast on a school day. Buy enough to cover all the people who will be eating breakfast for as many days as you wish to serve oatmeal in the week. Buy some berries, other fruit or chopped nuts to top the oatmeal each day. These can be fresh, canned or frozen. Just buy what you enjoy making sure they don’t contain added sugar. The night before, lay out all the bowls and cutlery you’ll need in the morning. Prep berries or other fruit you wish to use to top your cooked oatmeal. Leave these in a container in the refrigerator. Put everything else in the place it will be needed for breakfast. This saves time and lets you enjoy your meal without rushing. In the morning, follow the instructions on the box. For the brand I buy, the instructions are simple. I peel off the plastic surrounding the frozen oatmeal, place the oatmeal in the microwave safe bowl I want to use, cover it with a piece of waxed paper (or a microwave cover), and cook it on high for 2 minutes and 30 seconds. Then I stir and finish cooking on high for another 1 minute 30 seconds. While I’m pouring my orange juice and getting out the toppings I want to use, the oatmeal rests for one minute. I sit down and drop berries, cut up peaches or apple slices and a few chopped nuts on top and enjoy. Notice, I did not sprinkle sugar on top. The fruit contains enough sweetness and added sugar is counterproductive to learning. Prep time is 5 minutes. Clean up after I eat is also 5 minutes. 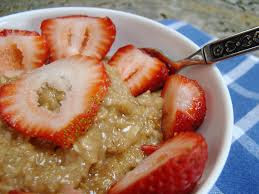 To save both time and money, steel cut oatmeal can be bought in bulk at the market and prepared in advance. Look at the instructions on the package. Decide how many servings are needed for as many people and days as the oatmeal will be eaten in a week. Then prepare this number of servings in a very large pan, following the directions. After the oatmeal is cooked, let it cool. Then divide it into individual servings scooping it into plastic containers, or zip type bags. It’s also possible to wrap a big scoop of cooked and cooled oatmeal with waxed paper, and then place the wrapped oatmeal in a large freezer safe container or bag. For serving homemade frozen oatmeal, place an unwrapped frozen serving in a microwave safe glass container or bowl and microwave. You’ll have to experiment to see how many minutes/seconds are necessary. Microwave power varies, and the size of the portion matters too. Experiment by following the instructions for the store bought frozen oatmeal, increase or decrease the time until you see what works for your situation. If you want to get good grades so you have a better chance of winning a Full Ride Scholarship or grant to college, you have to do all the right things. Eating breakfast is one of those things. Steel cut oatmeal is one example of what you might select. It isn’t the only wholesome or nutritious meal you can have. There are many others. Find something you like, that’s easy to prepare and eat breakfast every day. You’ll feel better and your grades will improve.